The Dylos DC1100 Pro Air Quality Monitor is what I’ve often used to test the effect of air purifiers and to test whether indoor air is safer than outdoor air. The particle counter gives readings of the number of particles 2.5 microns (also known as “micrometers”) and above, as well as 0.5 microns and above per 0.01 cubic foot. They’re available through Amazon for $261. Is it accurate? 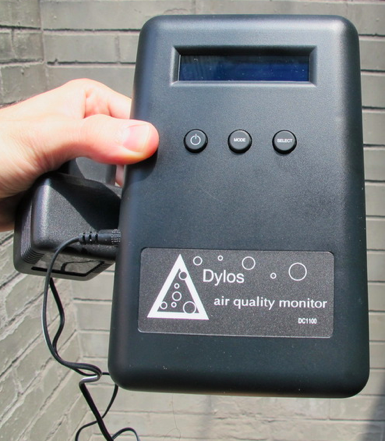 We tested the Dylos against official PM2.5 readings (and another test of the Dylos versus Met One BAM PM2.5 readings). In our tests, we compared how well it performed against two other popular models–the Laser Egg and the Air Visual. We also tested whether humidity affects its accuracy. They also produce a non-pro version that detects down to 1 micron, rather than 0.5 microns. Does this reduced sensitivity make the readings less accurate or less useful? To get some data on the question, we ran a test of the accuracy of the 1 micron Dylos against official PM2.5 readings. Does the monitor measure pm2.5 particulates?